Growing up in India, one of the facts that really amazed me , was the variety that one could find in the cuisine from the East to the West and North to the South. 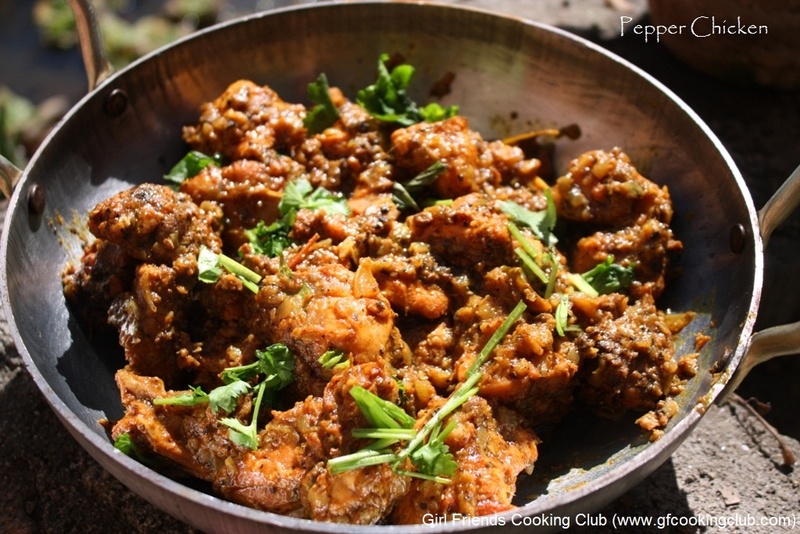 Since I love spicy food, I was really looking forward to trying out this recipe for Pepper Chicken which is inspired by the Chettinad Pepper Chicken, which is a very popular dish, which originates from the Chettinad region of Tamil Nadu in South India. 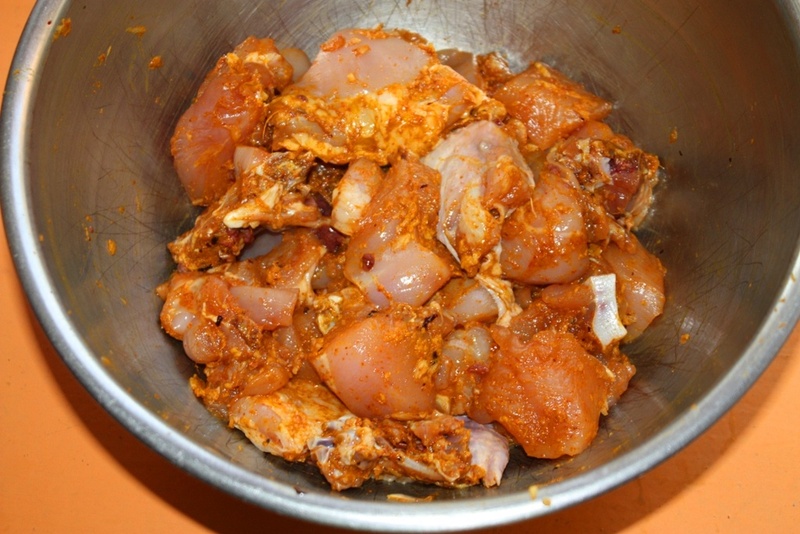 While the chicken marinates, set aside all the required spices and finely chop up the onions, tomatoes and coriander. Take 2 Tbsp Whole Black Pepper and coarsely grind it . 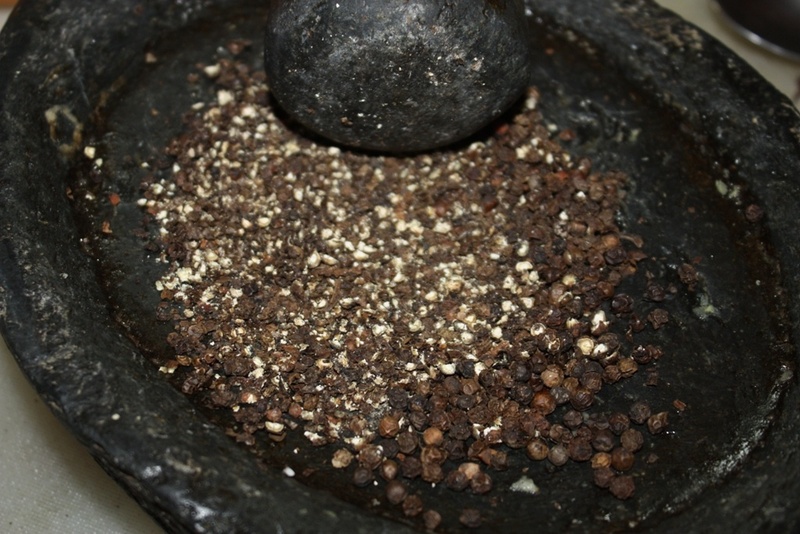 The pepper is always added at the end of the cooking process, so that the dish can retain the wonderful spicy flavor. Heat oil in a pan and add in all the whole spices i.e. 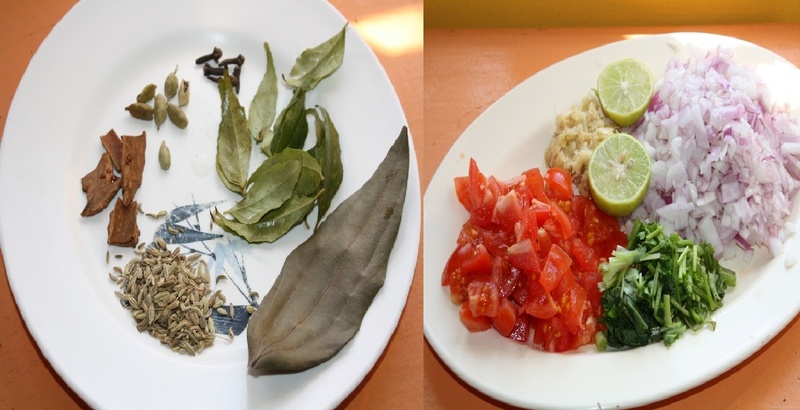 Cloves, Cinnamon sticks, Cardamoms, Bay Leaf , Fennel seeds and Curry Leaves. Stir fry for about 15 to 20 seconds and then add the chopped onions and fry till the onions turn translucent. Then add the ginger garlic paste and 1/2 Tsp Turmeric and fry for a minute. Keep stirring constantly so that the masalas do not get burnt. Keep the heat on medium. Then add the chopped tomatoes and coriander powder and stir fry. 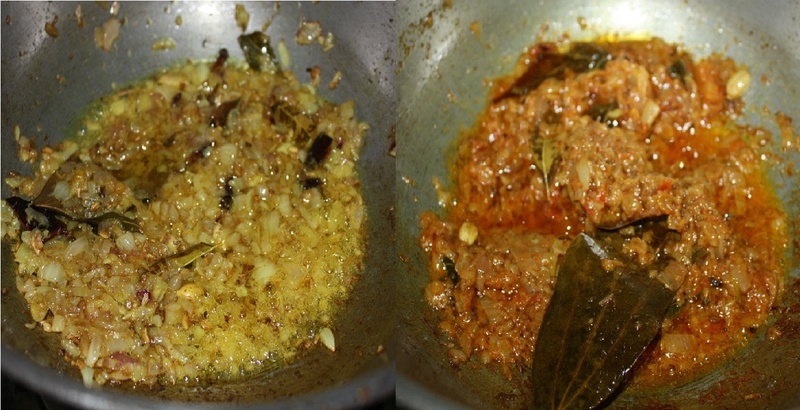 Add 1/4 cup water , lower the flame and cook for 2-3 mins till the oil separates from the masala. Add the marinated chicken pieces to pan and mix well. Add salt and cook the chicken for couple of minutes. Add 1/4 cup water, lower the flame, cover and cook for 8-10 mins. In between, stir the chicken so that it does not stick to the pan. If the chicken is not cooked, add little bit of water and cover and cook again till the chicken is tender. This dish is a dry chicken dish, therefore, ensure that you only add sufficient water to cook the chicken. After the chicken is cooked, add the crushed pepper powder and mix well. Switch of the heat. Add the lemon juice and mix again. 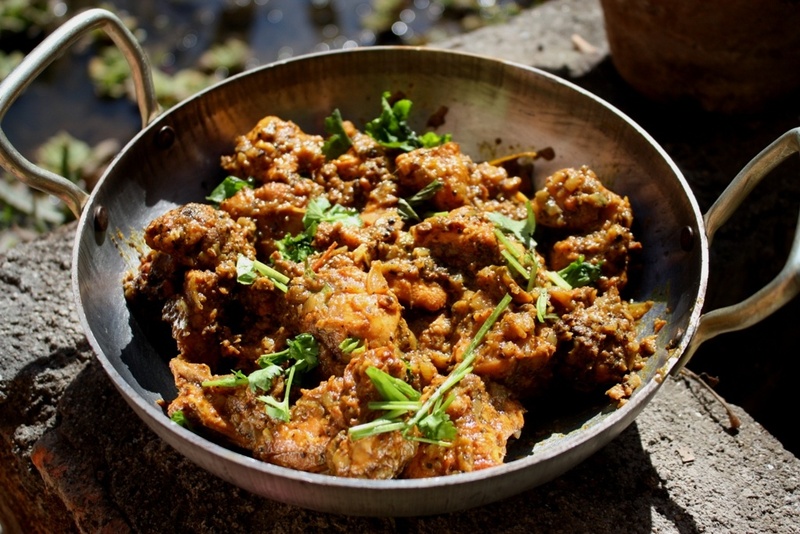 Garnish with chopped green coriander and serve hot with Chappati or Rice. 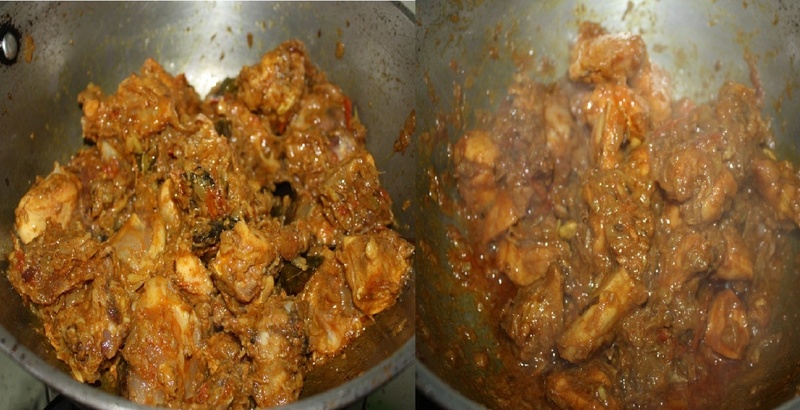 This entry was posted in All Recipes, Chicken and tagged chettinad pepper chicken, Pepper Chicken by Kamakshi. Bookmark the permalink.